Non-conforming products are a major concern for the building and construction industry. They’re products that don’t meet Australian Standards. They’re not fit-for-purpose, aren’t of acceptable quality, contain false or misleading claims or are counterfeit. The non-compliant use of products, using a product in the wrong way or the wrong place, is also a problem. For building professionals, the potential for liability is enormous and there’s a daily risk of working on building sites with them. There are also concerns for people’s safety and the value of their homes and buildings. Substandard products are being found across all areas of construction. The recall of Infinity electrical cable is just one example of how risky and dangerous they are for the public and the building sector. Master Builders surveyed members back in 2014 and again in 2017 to determine their extent and nature in the Queensland building supply chain. Encouragingly, while non-conforming products remain a significant problem, increased vigilance has led to a decrease in their prevalence, with only 10 per cent respondents reporting them on their sites in 2017, compared to 40 per cent back in 2014. 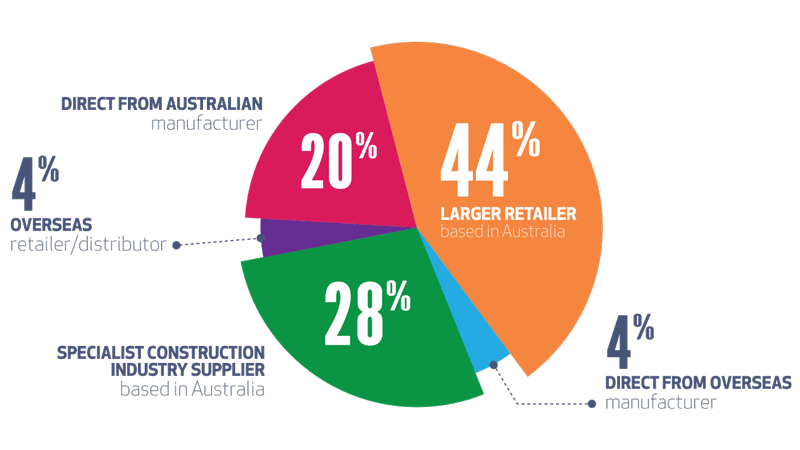 Non-conforming products are most likely to be sourced from Australian-based retailers with 70 per cent saying that they bought them from a large retailer or a specialist construction industry supplier. While anecdotally the problem was one of cheap overseas manufacture, 20 per cent of respondents reported that the non-conforming product was purchased from an Australian manufacturer; a five per cent increase from 2014. In most cases the responsibility is being borne by contractors and building certifiers, with the builder or tradie having to rectify the problem in more than half the cases. To protect yourself and your projects you need to look for 'evidence of suitability'. You can also get across what Master Builders is doing about them.